REAL ESTATE TRANSACTION NETWORKING EVENT - Environmental Performance Inc. The first Real Estate Transaction Networking event was held on October 18, 2017 at Mesero in Addison and was co-hosted by Steve Burris of Capstone Commercial Group, Ben Hogan of Capital CDC, and Sach Prasad of Environmental Performance, Inc. The event was attended by commercial brokers, investors, and lenders. The objective of the event was to create networking opportunities between brokers, investors, and bankers to facilitate real estate transactions. The event was well attended and a success. The next Real Estate Transaction Networking event will be held at the beginning of 2018. 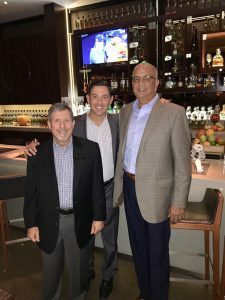 Photo Caption: First Real Estate Transaction Networking event co-sponsors (from left to right); Ben Hogan with Capital CDC, Steve Burris with Capstone Commercial Group, and Sach Prasad with Environmental Performance, Inc.